Remember the scene in the movie “White Christmas” where they get off the train in Vermont and there’s no snow? That’s what it was like to arrive in Ortisei two days ago. Normally Ortisei should be a hotbed of skiing, snowshoeing and sleigh rides. Apparently much of the Alpine region from Switzerland to the Italian Dolomites is like this: cold and dry. From our room we have a fabulous view to snowy peaks, but the surrounding valley is a dry winterscape. 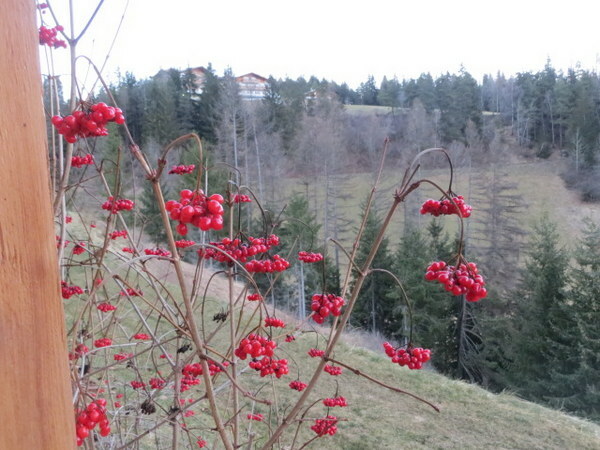 We have been to Ortisei three times in the summer and despite the lack of snow we still find it charming. Up high (2100 meters or so) we did manage to find a snowy trail for our Christmas Eve hike. People are here to ski and in the high areas they do so. While having lunch at the rifugio we met a group of Americans planning to ski the Sella-Ronda on Christmas Day. Three of them were Portlanders! Click on any picture for a slide show. Sunrise view from our room, Dec 24. Lovely! Ric with the ski area Seceda far in the distance. Sunny southern exposure made eating out-of-doors possible even on Dec. 24. View from lunch spot, over the centerpiece to the Sassalungo. Ran into some people from Portland at Rasciesa. What are the chances! First time we’ve eaten outside on Dec. 24. Cute little Ortisei bustles with holiday visitors on Christmas Eve. The Mercato di Natale features adorable wooden kiosks offering local products and artisanal items. In summer we were petting horses and cows in this high meadow. Well, darn for you that there was no snow. Still tho, it looks like a beautiful place to be spending Christmas. As your son told you, you wouldn’t have had any different in Portland and the mountains around us. Skiers here are still waiting to get on the slopes! Buon Natale from a somewhat grey (with a little blue sky trying to peek through) Seattle. Thank you MIchelle! Just spoke to our son in Portland. He said it was green there…A welcome by-product of living in a rain forest. Hope you have a wonderful day! I love to escape with you on your Italian adventures. I am a hiker and photographer who takes weekly photos of some special scene that nature has to offer while my husband takes us on day hikes on woodland trails near our Pennsylvania home. Our summer vacations are day hikes in western US mountains. I visited Florence and Tuscany with 3 book club friends a few years ago and hope to return to Italy with my husband, brother-in-law and his wife to enjoy art & architecture, food & wine/ beer, and do some hiking on trails. What area(s) do you suggest for a 2-3 week stay where there are a number of good marked hiking trails? Northern Italy? Time of year? Hi Alice. Thank you for your kind words! As to where you can find well-marked trails, the Val Gardena is fantastic. This website http://www.valgardena.it/en/ has tons of info, although it centers on winter at this time. You can buy a pass that covers many lifts (12 I think) out of Ortisei, Santa Cristina and Selva, taking you to the higher meadows including the Alpe di Siusi. For more details of a few walks, you might look at my past blog posts on Ortisei trips we have taken in 2012, 2013 and 2014. (Especially the 2014 ones.) I would say Late July thru early September are the best times. The TI in any of the towns can give you more specific help. Also, the R.S. guide has some good hikes in the Alpe di Siusi. The book does not cover the Val Gardena and I think that is a shame. Rick is all about the 3 night stay and you miss a lot if you do not go beyond Castelrotto. Next July we have two weeks in Ortisei in an apartment and will explore some adjacent valleys that Italian friends recommend: the Val Di Fassa and the area around Sesto. We also love the Lauterbrunnen Valley in Switzerland. More expensive, but extremely accessible and interesting. We are talking about a week there in summer 2016 as the hiking is so amazing. Again, I think late July to early Sept are probably best. Winter hiking is great there too. We did so for New Year’s 2014.